Blueberries are definitely one of my favorite fruits and since this time of year they are not always a great price or particularly tasty I recently bought a bag of frozen wild blueberries and was pleasantly surprised how delicious they were. Other than the ridiculous blue they turned my entire mouth and teeth I am hooked on them right out of the freezer almost like a sorbet as a dessert option. Did you know that of all the berries wild blueberries are the leader in the antioxidant department ? In fact they have the highest antioxidant capacity per serving, compared with more than 20 other fruits. And since antioxidants are what help our bodies protect against disease and age-related health risks, I say we should be eating these berries by the bowl full. Every day, our cells wage a battle against free radicals - unstable oxygen molecules associated with cancer, heart disease and the effects of aging, why not add these into your diet right? And who can't use a hand in the fight against inflammation which we know is a leading factor in brain aging, Alzheimer’s disease and other diseases of aging. The amazing doses of antioxidants are highly concentrated in their deep-blue pigments and they are without a doubt one of the most powerful foods you can eat to help combat disease and promote healthy aging. The many potential health benefits of wild blueberries include ongoing brain research that shows that blueberries may improve motor skills and actually reverse the short-term memory loss that comes with aging, making blueberries a natural “brain food". 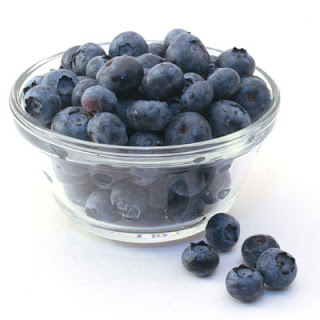 Research shows that blueberry compounds may inhibit all stages of cancer. Research indicates that blueberries may protect against heart disease and damage from stroke. Like cranberries, blueberries may help prevent urinary tract infections. Studies around the world have indicated that they may improve night vision and prevent tired eyes. I mean how can you go wrong, I can't wait to find some at the farmers market in the summer but until them you can find me in the freezer aisle buying these babies by the bags full.